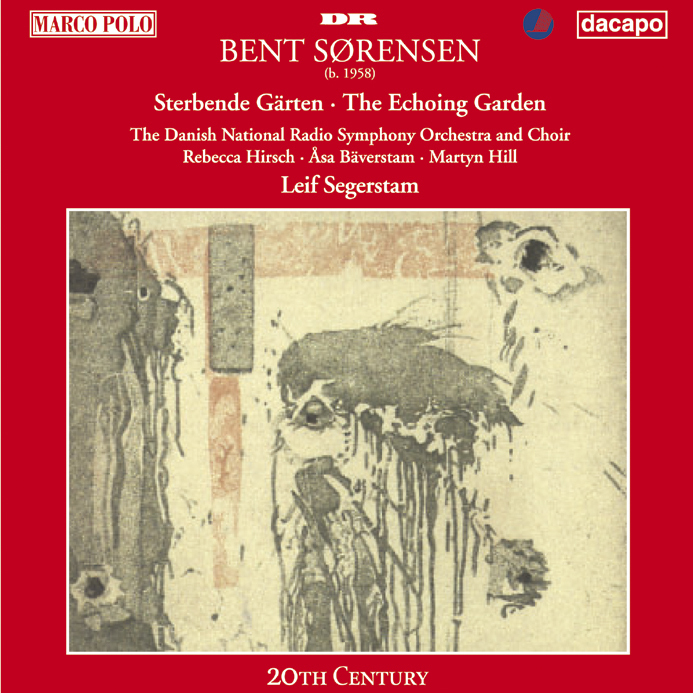 Bent Sørensen is one of the most talented of the younger generation of Danish composers. He studied composition with Ib Nørholm and Per Nørgård. His music is highly evocative and the titles of many of his works reflects his fascination with concepts like dissolution and decay. Sterbende Gärten was given the Nordic Counzil Music Prize in 1996. I Allegro, molto fluente 14:07 12,80 kr. II Barcarola Lento - 8:04 9,60 kr. III Stamped Presto 4:53 6,40 kr. I Chorus: Lento, molto lontano - 5:46 9,60 kr. II Allegro ritmico 3:49 6,40 kr. III Tenor solo and chorus: Molto fluente 8:38 9,60 kr. IV Soprano, tenor and chorus: Andantino sospeso, con fluttuazione 13:01 12,80 kr. V Soprano solo and chorus: Calmo transparenza - 5:17 9,60 kr. VI Soprano, tenor and chorus: Molto fluente 5:54 9,60 kr.